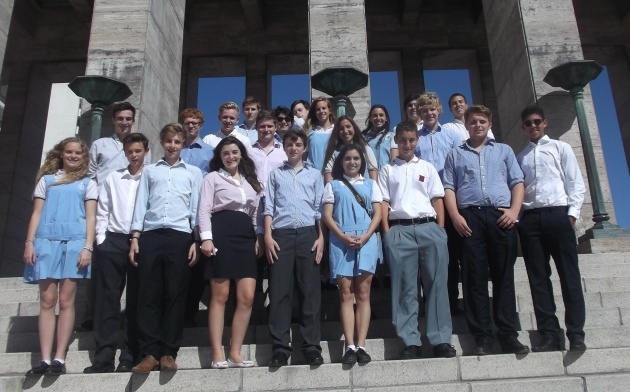 The Spanish Faculty has established a strong exchange link with San Bartolomé School in Rosario, Argentina. During half term, 15 pupils and two members of staff spent ten busy and happy days in Rosario, as described by Sam Roberts (Rb UVI). After a 30-hour journey, we could have been forgiven for not being in the mood to watch a football match. However, “El Clasico” was exactly what we needed to wake us up. In a stadium with a capacity of just over 40,000, there must have been 50,000 people at least. Every seat was filled, and then some! All of these fans were Central supporters, as fans of their rivals, Newell’s Old Boys, weren’t allowed into the stadium on the day of the local derby. The match ended as a win for Central, which was a relief, because as happy as these fans were, I daren’t think how their attitude would have changed if the result had been different! After the match, we met up with our host families at the school and retreated back to their houses for a much-needed sleep. This was our first day at San Bartolomé School, and we met at 8 o’clock for breakfast before going for a tour around the city. This took us out to the outskirts of Rosario, and we saw for the first time the Rosario-Victoria Bridge, which spans 608m over the Paranhá River. The tour also took us to the famous Monumento a la Bandera (National Flag Memorial). The monument was inaugurated on 20th June 1957, on the anniversary of the death of Manuel Belgrano, the creator of the Argentine flag. This was the big day – the England v Argentina football match. We would have to wait, as first we went to the nursery school of San Bartolomé, where we read books to the kids, and got to learn about “The Rabbit and the Bear”… It was then time to head out to the field for the big international. But even with the captaincy of Jake Morris, we couldn’t salvage a win. In the end we lost 3-2, and there was no “hand of God” to blame it on. A well-deserved barbecue was in order, Argentinian style. We started off the day with a chemistry lesson, in Spanish of course, followed by a presentation made by a few of the Upper Sixth to those students intending to come to England next summer. Finally, a day to do nothing. We met in the morning at school and then took a bus to “La Estancia”. This is a ranch where you can spend the day horse-riding, fishing and generally dossing about, and that’s exactly what we did. Most of us voted for fishing, as it didn’t require much activity, which was a fairly unsuccessful venture. After proving our fishing incompetence, we rode back to the ranch on the trailer of what can only be described as a “classic” tractor. After returning to school, we all went to a bar called “Johnny B. Good”, which gave us more time to learn about our Argentinian counterparts. The morning was spent helping out with the kindergarten, mainly helping to make dulce de leche cakes – reason enough to visit the country! This was followed by a tour around “El Circulo”, the main theatre in Rosario, and then a walk along the Paranhá River to the modern art museum. Despite it being closed, we made the most of it and had lunch looking out to the river. Today was the second day of the trip when we could relax completely. We took a speedboat to the island on the other side of the river. After a week of speaking Spanish, this is exactly what we needed. This was our final full day in Rosario, and we all met up to spend the final day with all of our hosts. The day was spent mostly playing a football tournament, which slowly turned into Argentina vs. England. Again, a day mainly dedicated to chilling out, it was our last real opportunity to spend some time with our fellow Argentinians. 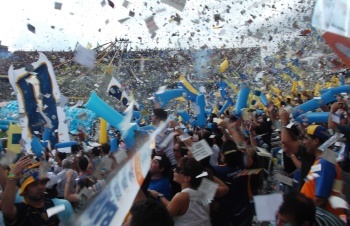 The day we all dreaded… leaving Rosario. We met at the school with our suitcases in hand and proceeded to Starbucks with everybody for our last meal in Rosario. After a goodbye that lasted far longer than intended (everybody said goodbye about six times), we sadly left the school, but I think most of us knew we would be back as soon as possible. Then came a four-hour coach journey to Buenos Aires, the neighbouring city to Rosario. We arrived about midday, and after checking into our hotel we went to the local shopping mall, where everything cost about twice as much as in Rosario. That night was spent at a tango show with a sit-down meal. We had been feeling pretty happy with ourselves after the tango lessons a few days previously, so the show quickly brought us back down to earth. We arrived back to the hotel fairly late, which was a good thing in the end, as we had a 12-hour flight and a 24-hour journey ahead of us the following day. I would recommend the Argentinian trip to anyone looking at doing Spanish in the future, as it provides experience of the language, instead of just sitting in a classroom with a grammar book. 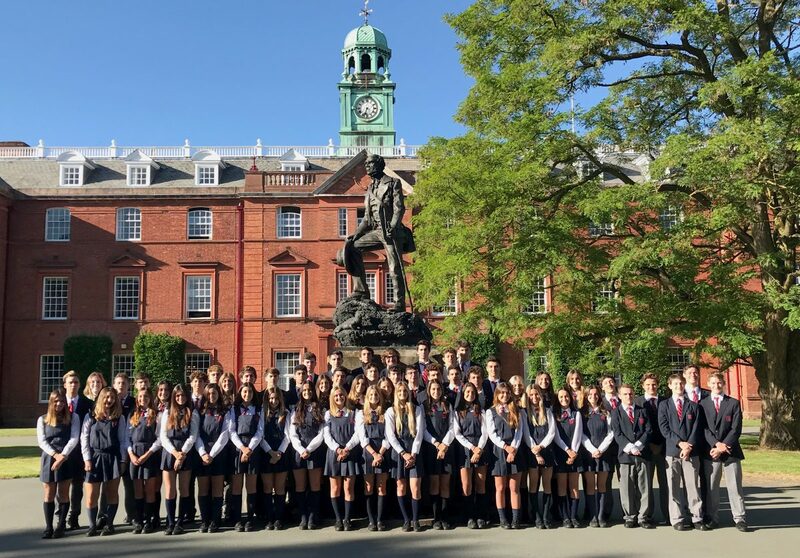 We would like to thank Mr Wright and Matron Donohue for making it a great trip – and of course everybody in Argentina for being so hospitable and welcoming towards us. ¿Qué implica enseñar por PROYECTOS? Es un trabajo que plantea una organización diferente de los contenidos escolares. – Integra necesariamente diversas disciplinas. – Desarrolla capacidades de diferente tipo y nivel. – Promueve competencias de expresión oral y escrita. – Estimula habilidades para el TRABAJO COLABORATIVO. (Ver video:http//youtu.be/3Kyw5O3Hn1K “De donde vienen las buenas ideas”) y por sobre todo……. – Entrena para la solución de problemas. BULLYING: Lautaro Cabral – Tomás Wade – Ignacio García – Manuel De Marco – Tomás Cedaro. VIOLENCIA JUVENIL NOCTURNA: Lautaro Abriata – Wei Wei Cai – Nicolás Dachesky – Lucio Gianni – Giuliano Manti. TRATA DE PERSONAS: Micaela Bressan – Maribel Lassaga – Josefina Marcón – Luciana Racciatti – Juliana Ramón – Josefina Robiolo. “ABRE LOS OJOS” Problemas de drogadicción en los jóvenes de Rosario: Rodrigo Peters – Franco Gazze – José Rainaudo – Santiago Suárez – Agustín Herfarth. Un Proyecto optimiza las condiciones de posibilidad de aprendizajes autónomos, espontáneos e inesperados. El docente sólo tiene que fomentarlos y monitorearlos. Autor Lucrecia AmigoPublicado el 20 noviembre, 2013 Categorías GeneralDejá un comentario en ¿Qué implica enseñar por PROYECTOS? El día 18 de noviembre se realizó un encuentro con los alumnos de séptimo grado con el objetivo de contribuir a la adaptación al nivel secundario. Los alumnos pudieron reflexionar previamente sobre las inquietudes y ansiedades que despierta comenzar un nuevo ciclo y luego intercambiaron testimonios con compañeros de primer año quienes hablaron de sus experiencias en esta nueva etapa. Por último los alumnos de séptimo tuvieron la oportunidad de ir conociendo a profesores, personal directivo e instalaciones propias del nivel secundario. El encuentro fue organizado por las áreas de psicología de ambos niveles y la profesora tutora de la escuela secundaria. El pasado 1, 2 y 3 de noviembre seis alumnas de nuestro Colegio y una alumna del Colegio San Patricio representaron a la delegación de SUDÁN en el IX Encuentro Nacional Uniendo Metas, Jóvenes para el Futuro en el Modelo de Naciones Unidas en la Pontifica Universidad Católica Argentina (UCA) en la Ciudad Autónoma de Buenos Aires. En esta oportunidad además diseñamos la bandera de la delegación, utilizando la técnica de collage participando del concurso que se nos había propuesto a todas las delegaciones. Días inolvidables para todas nosotras, llenos de emoción, nerviosismo y alegrías, participando de asambleas y plenarios que permanentemente nos llevaban al debate y a la toma de decisiones. Por supuesto no podía faltar la fiesta del sábado por la noche en Caix!! en la cual nos divertimos muchísimo. Si bien nos habíamos preparado como siempre y aún más, llevando a cuatro alumnas con experiencia (Camila Roncoroni –Victoria Gutiérrez Vicedo –Lucía Roncoroni y Liza Pasqualis) y dos noveles de 3er año (Josefina Soler y Danisa Lione), nos quedaba la duda ante la presentación de tantas delegaciones de distintos puntos del país si íbamos a estar premiadas. Pero la misma se disipó cuando a viva voz en un Auditorio repleto de asistentes se nos anunció nuestra mención de HONOR GRUPAL en la cual no sólo se puso de manifiesto el trabajo individual sino el del trabajo en equipo doblemente meritorio de aquellas alumnas con años en el Modelo que supieron sostener y ayudar muy bien a aquellas que no lo eran. Sólo nos resta decirles NUEVAMENTE GRACIAS POR PARTICIPAR Y DARLES LAS FELICITACIONES A TODAS!!!!! ¡Yo soy de Santa Fe! Nuestra experiencia empezó gracias a que fuimos elegidas por nuestras profesoras, Lidia Vila y Silvina Valenziano para formar parte del equipo que representaría al Colegio en las distintas instancias: local, departamental, provincial y, finalmente nacional. Comenzamos participando en la etapa local, que se realizó en el Club Atlético Provincial, donde logramos clasificar y viajar a Arroyo Seco para disputar la fase departamental. Allí salimos victoriosas por lo que seguimos en carrera, yendo a jugar a Santa Fe. Para la instancia provincial, el equipo ya había mejorado su forma de juego, no sólo gracias a los aportes técnicos de nuestras profesoras, sino también por la confianza adquirida entre nosotras en los distintos partidos. 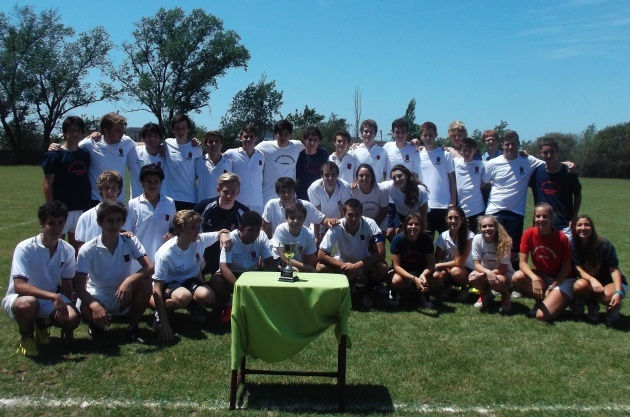 Tras un 6-0 contundente, nos pusimos muy contentas al saber que íbamos a representar a la provincia en los Juegos Nacionales Evita 2013, con sede en Mar del Plata. El sábado 2 de Noviembre, emprendimos viaje y arribamos a la ciudad de la Costa Atlántica por la mañana. Nos alojamos en el Hotel Garden, donde compartimos los días con chicos y chicas de otros departamentos de la provincia. Esto, junto con la experiencia deportiva, nos permitió disfrutar plenamente la semana. En esta etapa, competimos no sólo contra colegios sino también contra clubes y seleccionados. Jugábamos generalmente por la tarde, luego de la charla y preparación física brindada por las profesoras. Nos cruzamos con Santiago del Estero, Neuquén, Corrientes, Chubut y Mendoza, finalmente ubicándonos en el décimo puesto entre las veinticuatro delegaciones participantes. El viernes 8, luego de disputar el noveno puesto contra las mendocinas y perder por penales, por la tarde, emprendimos el regreso a Rosario. Después de diez horas de viaje, arribamos a la terminal de ómnibus Mariano Moreno reencontrándonos con nuestras familias para contarles anécdotas de esta maravillosa experiencia. Autor Lucrecia AmigoPublicado el 12 noviembre, 2013 Categorías GeneralDejá un comentario en ¡Yo soy de Santa Fe! Desde el mes de abril se llevó a cabo el certamen organizado por la Universidad Austral en varias instancias de juego. Los alumnos de 4º y 5º año participaron en equipo tomando decisiones en la conducción de empresas, asumiendo el rol de directivos. Para la toma de decisiones en cada una de las instancias que se jugaron, los “directivos de empresa”, debieron interpretar información contable, analizar informes financieros y considerar reportes económicos con variables que provocan causa-efecto y determinan las decisiones que deben tomar con precisión. Para esto deben hacer también cálculos de costos e inversiones que posicionan a sus empresas en un mercado altamente competitivo. Decidir sobre ampliación en planta, tomando créditos bancarios, inversión en Investigación y Desarrollo para posicionarse en el mercado, inversión en Marketing para lograr mejores niveles de ventas, capacitar al personal para minimizar costos. El equipo de 4º año “A” integrado por Lucio Achino, Valentín Fernández y Antonio Locascio lograron pasar con éxito la instancia Local, Regional y jugaron el 28 de octubre la final de la instancia Provincial, desempeñándose con éxito en sus habilidades directivas para conducir empresas. ¡FELICITACIONES! Cultura y Comunicación 5º año …….Lunes 11/11…….. 9 horas. Historia 4º año …………………………..Miércoles 13/11 ….9 horas. Filosofía 5º año…………………………….Jueves 21/11………..9 horas.